This is an article regarding girl’s soccer and the epidemic of concussions that are starting to plague it. Fifteen-year-old Allison Kasacavage, once a rising soccer star in Pennsylvania, is slowly recovering after suffering debilitating concussions while playing the game she loved. “It’s almost like I need a sign on my back saying, ‘My head is broken.’ And you can’t see it. It’s like not visible and it’s like not many people understand, “said Allison in an interview with Rock Center’s Kate Snow. Allison, who lives with her family in Chester Springs, Pa., has had at least five concussions. She is only able to attend school four hours a day. Her room is lit with soft blue light to ease her headaches and her family now eats dinner by candlelight. She is one of hundreds of girls across America each year who suffer concussions while playing soccer. With the steady popularity of youth soccer, more girls are playing the game than ever before. Girls make up 48 percent of the more than 3 million kids registered in US Youth Soccer leagues. Cantu said that the country is in the midst of “a concussion crisis” and that studies show girls are reporting nearly twice as many concussions as boys in the sports they both play. “What’s happening in this country is an epidemic of concussions, number one, and the realization that many of these individuals are going to go on to post-concussion syndrome, which can alter their ability to function at a high level for the rest of their lives,” Dr. Cantu said. Allison still remembers when she suffered her first serious concussion in October 2008. It came when she collided with another player on the field. “When I like got up, my head was like pounding,” Allison said. “There was, like, a pulse in my head. It was like the strangest thing. There was a heartbeat in my head and I had no idea what it was and why it was there. I have never felt that before and I was just so confused,” she said. After Allison had apparently healed from the concussion, she returned to soccer. She’d been a star player since she was six years old, working her way up to one of the top teams in Pennsylvania. She said that her identity had been wrapped up in the game and she felt pressure to please her coaches. Allison said that she was nervous about heading the ball, but continued to do it. “If you didn’t head the ball, you were like the weakest link,” Allison said. When heading, players attempt to use their foreheads to direct the ball, often jumping with opposing players, a move that can lead to collisions between players, bumped heads and strained necks. Dr. Cantu says that the act of heading is one of the most dangerous parts of soccer because players often collide. Allison suffered a third concussion in her final season of soccer and another two off the field, the latter because her spatial awareness had been impacted from her previous concussions and she hit her head on a table and other furniture, her mother said. 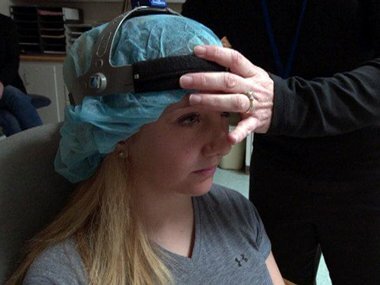 Her parents said that they knew about the danger of concussions in sports like football, but it wasn’t until Allison had her first serious head injury that they realized what a big problem concussions can be in soccer. “I think that we were blind to what was going on around us because, yes, it was about the team. It was about the winning. It was about all the, it was almost like a routine of, like I said, an awful lot of practices and you just went through it and really your lives rolled by with soccer being the most important thing,” said Lex Kasacavage, Allison’s father. Sports psychologist Richard Ginsburg says that enthusiasm for the game and the kids by parents and coaches, while well-meaning, might be making the concussion crisis worse. In Allison’s town of Chester Springs, about 30 miles from downtown Philadelphia, she is not alone. She has bonded with at least five other 14 and 15-year-old girls who have suffered concussions while playing soccer. Kimmie had her first concussion when she was 12. Those hits — heading the ball and being elbowed by a player in the head — ended her soccer career. Kimmie’s teammate Jenna Rohr made the same choice to continue playing in her game after getting hit in the head. Both Jenna and Kimmie have been unable to make it through a full day of school for almost two years. They still suffer from intense headaches, dizziness, nausea and vision problems. Along with their physical ailments, several of the girls NBC News spoke to have struggled with depression since leaving soccer. Some have taken anti-depressants. One teen soccer player, who is returning to the sport after suffering a concussion, said that she felt so terrible at one point that she even thought about suicide. Despite their experiences, the teens still love soccer and say they don’t discourage their former teammates from the sport. “I think like speaking for all of us, like we would do anything to just be able to play one more game,” Jenna said. Should heading be banned from girls’ soccer? Dr. Cantu has made the bold proposal that heading be eliminated from youth soccer under the age of 14. He said girls, because of their anatomy, may be especially vulnerable to concussions. New research suggests some body types may be more at risk than others. “We believe that individuals with very long, thin necks may be at greater risk,” Cantu said. Brandi Chastain, the Olympian who helped the United States win a World Cup, strongly disagrees with Cantu’s proposal to eliminate heading from girls’ soccer. Chastain said that girls need to be taught to create protective space around their bodies. She says heading isn’t dangerous if it’s done correctly. Back in Pennsylvania, the girls and their families are trying to educate people based on their own experiences. Despite their concussions, though, they say they don’t want to discourage girls from playing soccer. © 2019 Electric Soccer. All Rights Reserved.